Wright Chat :: View topic - Lindal Usonians? Well, that makes at least as much sense as any other reason. dimension, proportion, fenestration, etc, cannot feel identical, though both might be pleasant and even delightful to be in . . . There are other changes. The Lindal house is reminiscent, but not a copy by any means, and is a very good house on its own terms. To a lay person it may be just the same, but I believe it would be different experientially in many respects. The huge, open kitchen is an oddity to me. A galley kitchen, where a lone cook can get the work done without having to stop for a glass of pinot noir and a chat with guests, seems more efficient. But I suppose in the age of Lidia Bastianich and Martha Stewart, cooking has become a communal event. I had an apartment with a kitchen where I could sit at the table, reach into the 'fridge and handle the cooktop all without getting up. But I had to clean up in the bathroom. The night-time image of the Gordon-like house shows several novel features, but further snooping, of images linked at the bottom of the page, reveals a different version of the design that seems much closer to the Gordon opus. I haven't compared plans on any of these designs, yet. The open kitchen is a post-war development, for the most part -- and how much "post" I couldn't say, though my impression is 'seventies or later . . . ? up their own experience of building a home. Forewarned is forearmed ? company's history -- a great majority of them, indeed, if the longevity of the firm is any evidence. Still, some interesting-if-true items or issues were raised. selecting an inexperienced and over-committed builder. mention of roof sheathing material . . . The Silverton Model is interesting, but oddly, the guest suite has a larger bath and more closet space than the master bedroom. of mis-labeling, Roderick ? In any event, the actual use of the house is certainly at the option of the owner . . .
some cases recommending -- all along ? 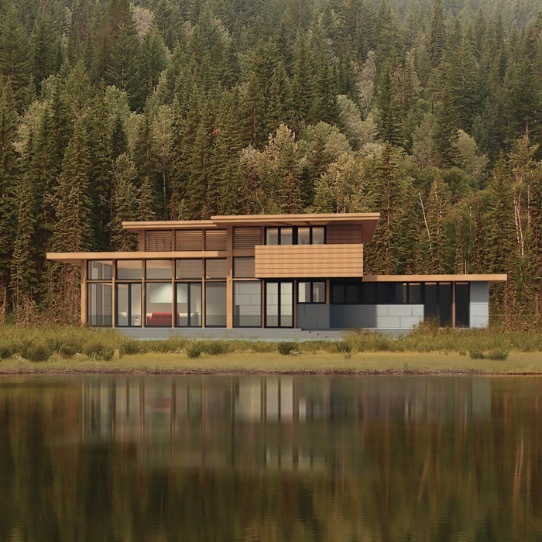 I'd love to see photos instead of renderings, if there are ever any built examples. On this page we find a tie-in between Lindal and the new digital record of T West . . .
No Wright-likes, yet . . .
Rather than judging this group of designs for what they aren't, perhaps the progressive option would be to appraise them for what they are. You might be right about this, but boy is it hard to do. For me at least. 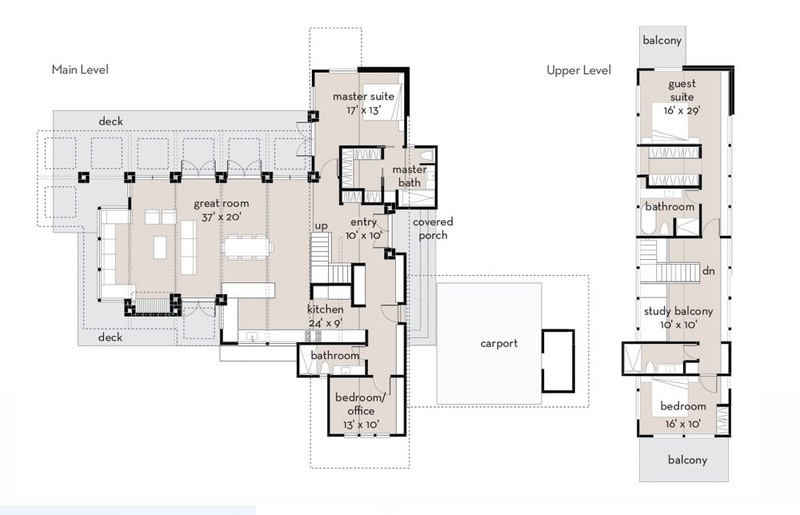 I notice that the "Silverton" plan is enlarged—Gordon was 2100 SF while this is 2800 SF. They've also added a 4th bathroom, which seems somewhat un-"Usonian" for each room to have its own bath. afford for each bedroom to have its own bath, who are we to object ? footage and certain technical niceties like adequate weatherproofing and drainage, in exchange. Presumably, the owners of Lindal Wright-likes will not be subjected to such oversights and the resulting indignities . . . 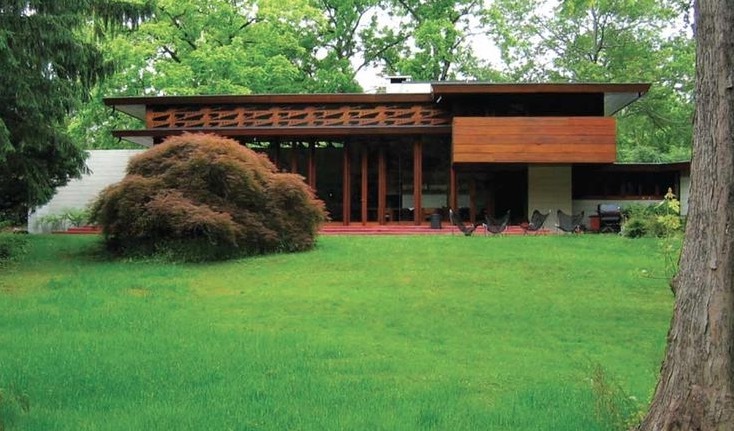 I think the effort to bring back this type of home might spark a revival of mid-century modern design. The fact that these examples have been modified for the current expectations of the potential buyers will result in a more successful business plan than a direct re-creation of the originals that we built at a time when the owners weren't as spoiled and/or affluent as now. I purchased the printed booklet and was impressed, not because they were copies of the original, but because they were very suitable Wrightian-inspired creations.